Live your life, take more action. If you not only want to get unstuck, but also learn how to develop lasting motivation, then this is the audiobook for you. The experienced team of ActionPodcast Coaches knows that ordinary things, consistently done, produce extraordinary results. 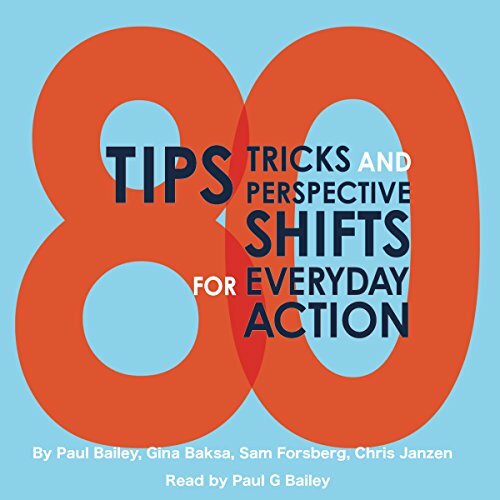 80 Tips, Tricks and Perspective Shifts for Everyday Action will help you gain and maintain the momentum you want, and the results you desire. In just a few minutes, you’ll find at least one step (and 79 more) that you can do today and feel the momentum building before you go to sleep tonight. ActionPodcast is your source of regular inspiration and motivation for taking positive action in your life. From health to careers, managing stress to managing time, this UK-based, international team of coaches provides down-to-earth practical insights and actionable advice for making consistent progress in every important area of your life.